Centennial Hall original Centennial Gymnasium built in 1942 and renovated in 2001 holds academic departments and programs, the College of Liberal Arts, office of graduate studies and research, a nursing wellness center and the Speech, Hearing and Language Clinic. Originally the gymnasium and had the first swimming pool on campus. An extensive renovation in 2001 turned the gym into a modern academic facility. 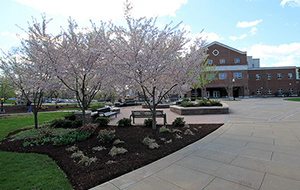 It was named in honor of the 100th anniversary of the founding of the Bloomsburg Academy in 1839.